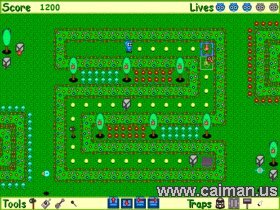 Caiman free games: Penka Mazes by Alexitron. The game has 100 levels in 3 different play modes. 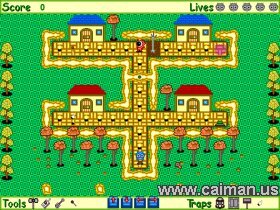 Penka is as blind as a bat, so you have to help him through the mazes by putting arrows on the map, else he won't be able to find the exit. 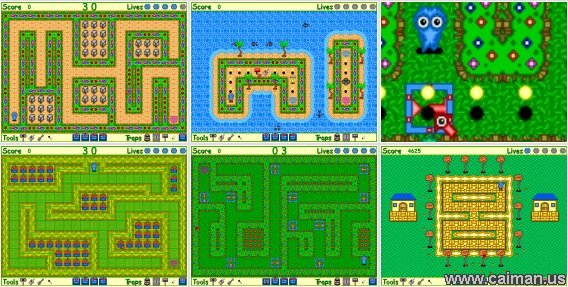 In this game mode Penka also starts running as soon as the level starts. So you also have to be quick with placing the items. The object of this mode is to collect all power spheres. This is the easiest and less nerve-racking mode. In this mode you get some time (eg 30 seconds) to place all arrows you need to lead Penka to the finish. When time is up Penka will start running. It's now easier to play. You can now use the arrow buttons on the keyboard to select the corresponding arrows on the game.You will also have a 6 seconds head start to start placing arrows before the character starts to run. (If you have played the game,you know 6 seconds are a big deal)You can now also delete misplaced arrows by right clicking on them.The esc. key will not end the game instantly now,a text box appears instead asking if you want to quit(this can also be used as pause)Added special thanks on the credits for user suggestions that made this update possible(in a general manner).Added an image alpha value to warps and portals to make them look better. -Tools and traps has been assigned to hot keys-(Q) and (ENTER) for Tools and (E) and (SHIFT) for Traps. -You can now also select arrows with W,A,S,D,. -The game will save every other level and will give you an extra live at save points if you have less than 3. -In Time Attack mode the timer has been reduced to increase the challenge and the character will run super fast to shorten the wait. -In Story Mode you can now skip the cut scenes. -Some floor images has been repainted to make some levels easier on the eyes. -I did my best to get rid of typos but there may still be some of those in the game. -A better insane creations logo has been added. -The game will not change the resolution of the screen. Zelda's Story - The Leg.